The subclass Chaetothyriomycetidae comprises three orders (Chaetothyriales, Pyrenulales, and Verrucariales) and is characterized by a large ecological diversity (Geiser et al. 2006). Two of the three orders include mostly lichenized taxa: Verrucariales, which predominantly colonize rocks, and Pyrenulales, which are mainly found on trees and are particularly diverse in the Tropics. 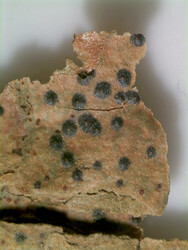 Species of Chaetothyriales are strictly non-lichenized, and are often called black yeasts, in reference to their melanization and to their particular growth form. Many of these species are known as animal and human opportunistic pathogens (de Hoog et al. 2000). Other non-pathogenic strains are sometime isolated from the environment thanks to enrichment methods (Prenafeta-Boldú et al. 2006). Recent studies have shown that a group of peculiar fungi, colonizing rock surfaces in arid and semi-arid environments and highly adapted to these extreme habitats, also belong to the Chaetothyriales (Sterflinger et al. 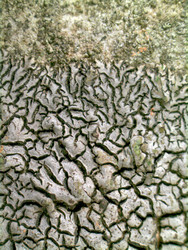 1999, Ruibal 2004). Finally, altough most of the known species in Chaetothyriales appear to be strictly anamorphic, other species occur as teleomorphs. They mostly belong to the genus Capronia, and are known as hypersaprophytes, growing on decaying wood and mushrooms (Untereiner 1997). Members of Pyrenulales and Verrucariales are generally found as teleomorphs, whereas members of Chaetothyriales are mostly known from their anamorphs, to the exception of species of Capronia. In Chaetothyriomycetidae, teleomorphs are characterized by perithecial fruiting bodies, and bitunicate asci with a dehiscence ranging from fissitunicate to evanescent. Their vegetative morphology varies a lot according to their lifestyle (e. g., formation of a thallus for the lichenized species, meristematic growth for the non-lichenized rock-inhabiting species, yeast-like stage for the opportunistic pathogens, ...). Historically, classifications of ascomycetes treated either lichenized or non-lichenized taxa, but rarely both, since they were recognized as two different groups (Acharius 1810; Lindau 1897; Zahlbruckner 1926). It is only in the twentieth century that these classifications were merged (Luttrell 1951, 1955; Nannfeldt 1932), and indeed, the Chaetothyriomycetidae stand as the prime example of the need for such a combined system: this sub-class includes both lichenized taxa (Pyrenulales and Verrucariales) and non-lichenized taxa (Chaetothyriales). In early classifications (Luttrell 1951, 1955), non-lichenized Chaetothyriomycetidae (Herpotrichiella- ceae) were attributed to the Pleosporales based on their centrum development. Lichenized taxa were first thought to belong to the order Xylariales based on their ascus type and centrum, identified as Xylaria-type (Luttrell 1951, 1955). 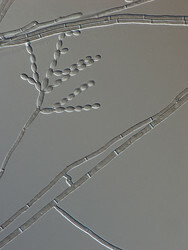 In Eriksson’s system (1982), which divided the euascomycetes into four groups according to ascus type, the new orders Pyrenulales and Verrucariales were placed in the bitunicate group, whereas the two non-lichenized families Chaetothyriaceae and Herpotrichiellaceae were included in the bitunicate order Dothideales (Eriksson 1982). Barr was one of the first authors to consider the three orders Verrucariales, Chaetothyriales and Pyrenulales (at that time included in the Melanommatales) as closely related, based on ascus type (bitunicate or secondarily prototunicate) and hamathecium structure (insertion of sterile filaments in the centrum, either pseudoparaphyses or periphysoids) (Barr 1983). Molecular studies have now confirmed their close phylogenetic relationships. The name Chaetothyriomycetidae was first proposed to accommodate the order Chaetothyriales within a subclass (Kirk et al. 2001). Subsequently, the order Verrucariales was shown to be sister to Chaetothyriales (Lutzoni et al. 2001) and was therefore included to the Chaetothyriomycetidae (Eriksson 2001), followed by the Pyrenulales (Eriksson 2006). Acharius, E. 1810. Lichenographia Universalis. Göttingen. 689 p.
Barr, ME. 1983. The ascomycete connection. Mycologia 75: 1-13. Eriksson, OE. 1982. Notes on ascomycete systematics. Systema Ascomycetum 11: 49-82. Eriksson, OE. 2001. Outline of Ascomycota - 2001. Myconet 7: 1-88. Eriksson, OE. 2006. Outline of Ascomycota - 2006. Myconet 12: 1-82.
de Hoog, GS, Guarro, J, Gené, J, Figueras, MJ. 2000. Atlas of clinical fungi, second edition. CBS, Utrecht, the Netherlands, 1126 p.
Kirk, PM, David, JC, Stalpers, JA. 2001. Ainsworth & Bisby's Dictionary of the Fungi. CAB International, Wallingford, UK, 650 p.
Lindau, G. 1897. Pyrenomycetineae, In: Engler A, Prantl K eds. Die Natürlichen Pflanzenfamilien. Verlag von Wilhelm Engelmann, Leipzig, p. 321-491. Luttrell, ES. 1951. Taxonomy of the Pyrenomycetes. Univ Missouri Stud Sci Ser 24: 1-120. Luttrell, ES. 1955. The Ascostromatic Ascomycetes. Mycologia 47: 511-532. Lutzoni, F, Pagel, M, Reeb, V. 2001. Major fungal lineages are derived from lichen symbiotic ancestors. Nature 411: 937-940. Nannfeldt, JA. 1932. Studien über die Morphologie und Systematik der nichtlichenisierten inoperculaten Discomyceten. Nov. Act. Reg. Soc. Upsal. 8: 1-368. Prenafeta-Boldú, FX, Summerbell, R, de Hoog, GS. 2006. Fungi growing on aromatic hydrocarbons: biotechnology’s unexpected encounter with biohazard? FEMS Microbiol Rev 30:109-130. Ruibal, CV. 2004. Isolation and characterization of melanized, slow-growing fungi from semiarid rock surfaces of central Spain and Mallorca (Doctoral thesis, Universidad Autónoma de Madrid/Merck, Sharp & Dohme de España, Madrid), 157 p.
Sterflinger, K, de Hoog, GS, Haase, G. 1999. Phylogeny and ecology of meristematic ascomycetes. Stud Mycol 43:5-22. Untereiner, WA. 1997. Taxonomy of selected members of the ascomycete genus Capronia with notes on anamorph-teleomorph connections. Mycologia 89: 120-131. Zahlbruckner, A. 1926. Catalogus Lichenum Universalis. Leipzig: Borntraeger. 480 p.
Thanks to André Aptroot for providing the specimen.